Today I'm gonna share a little tip on guitar picks. A guitar pick is an essential item in a guitar player's life. It is used to strum or pluck the strings of the guitar( you could still use your fingers, of course) It comes in several sizes, thickness and is made of different materials like plastic, rubber among others. It is lightweight and usually triangular in shape. *picture taken from Dunlop's website. The material and thickness(gauge) of the guitar pick will affect your overall guitar sound. A thick pick usually produces a brighter tone. I suggest you try different kinds of picks and decide which one is for you. 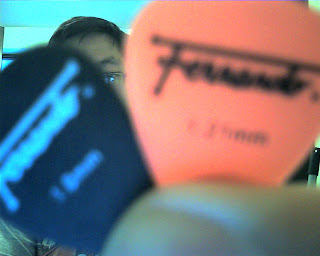 As for me, since I easily tend to lose my picks when I play gigs, I prefer to use Fernando guitar picks from JB Music. It only costs 8 pesos each($0.18) and it plays really nice. It feels good in my hands. And since it's really affordable(great for dads like me! ), losing guitar picks hurt less now. Another good guitar pick I like is the Dunlop Tortex 1.00mm guitar pick (the blue ones) which were the ones I used before. Where can I buy Tortex picks here in the Philippines? Hello Mare! I believe you could buy Dunlop Tortex picks at JB Music or Perfect Pitch. Thanks! Hello, can I order them online?